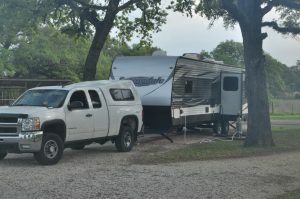 Post 112: Whispering Oaks RV Park, Weimar, Tx - A Snails Life and Lovin' it! Nice place close to HWY 10. Once again, we looked up the highway I-10 about 2 hours travel time to find a suitable location for the night. This time we found Whispering Oaks RV Park, Weimar, Tx . Joy called the night before to find out about the park and to see if we needed a reservation. The friendly owner answered the call even though office was closed. Joy explained to owner of her strange question saying that we worked on the road and needed internet. The owner said theirs was very strong. They offered 100% free internet. Joy was still a little miffed at where we were currently staying and said, sadly where we are right now, they said the same thing, only the internet is horrible, we can’t even work. The owner assured Joy that hers was high speed and that we would have no problems. So, the next morning, we pack up and hit the road. Close to 3 hours later due to traffic and fueling up we arrive at Whispering Oaks. Yes it was close to the highway, but we knew how to fix that issue. But, as soon as we turned into the driveway, we had “Lite” internet. Sweet! They have many sites that were full of people who were staying longer than 1 night and a large section that was dedicated to 1 night over nighters. We had a choice of where we wanted park. Bill chose the furthermost spot away from the highway which also turned out to be a corner lot. We had a pull through spot with to very mature trees on either side of us, grass for the dogs to enjoy, a picnic table and a really cool acorn fire place. Our site was at the back corner of the lot, so no one else was behind us or on one side of us. Once we were settled in, Bill took the dogs off to enjoy the dog park, while Joy sat down to begin working. Ahhh what a pleasure it was to work with high speed internet again. As Joy worked she did hear a train go by right beside the campground as he blew his whistle 3 times. Thankfully it was a very short train. Hmmm yes, Joy did recall someone mentioning that in the reviews, but the way it was mentioned as Romantic, Joy took it as a small train that ran around the campground for kids lol. Joy did not realize the person meant it was a REAL train. Awe well. WE STILL HAD HIGH SPEED INTERNET lol. As Rv Parks goes, this is a good one, our site is level, we have a nice grass patch in front of us, the site is a decent size. With the a fore mentioned, trees, table and acorn fire pit. There seems to be room between each site and the roads are paved. The sites them selves are gravel so, its easy to be level on. The owner was very friendly and helpful and the cost was $37.00. Convenience store with RV supplies, grocery items, ice, sodas, snacks, ice cream, etc. If you need a place to stop, this is not a bad one, just remember, you do hear the traffic from the highway and a train goes by from time to time.